LAHORE: Pakistan People’s Party (PPP) Co-Chairman Asif Ali Zardari on Monday dropped a clear hint that he had a hand in the ouster of the Pakistan Muslim League-Nawaz (PML-N) government in Balochistan, as he accused deposed prime minister Nawaz Sharif of following “the chaos theory that was once followed by Hitler”. “Remember whenever I have made a claim I have fulfilled it. 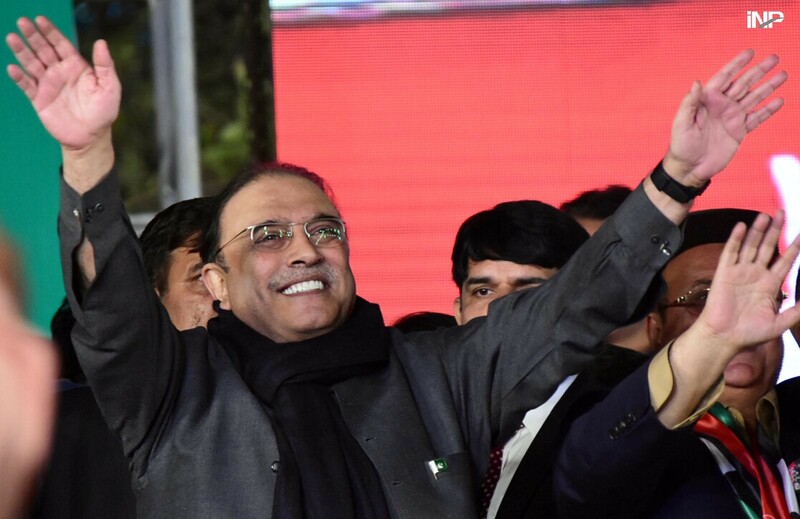 I told you I can end their government and it has happened,” a charged Zardari said while addressing a PPP power show at Lahore’s historic Mochi Gate ground. The public gathering was held to express solidarity with Kashmir and the Kashmiris’ struggle against the Indian state brutality. Take a swipe at his archrival, Zardari said that Nawaz is “purposefully creating an environment. He is using chaos theory just like Hitler did… and wants to take over everything of the public. But we won’t let them do this”. “We will not leave him because if we do this now then even Allah may not forgive us. He is a national thief,” Zardari said. The former president said that Nawaz stole the mandate of the Kashmiris in collusion with an influential person, whose name would be disclosed ‘at the right time’. He also accused the Pakistan Muslim League-Nawaz (PML-N) chief of ‘stealing from the people of Pakistan’, and said he prays that may the people get rid of Nawaz and PML-N.
“PPP has had a law passed in the parliament that would curb rigging unlike what turned out to be the case in the general elections of 2013,” Zardari said, adding that his party would stand victorious from all across Pakistan in the next general elections. Zardari took credit for the China-Pakistan Economic Corridor (CPEC) and said it was the PPP that initiated the billion dollar project. He said that the PML-N leaders do not even understand the idea of the CPEC. “They think it is a scheme for taking loans,” Zardari held. “The PPP leaders faced jails for the sake of democracy,” he said while adding that PPP Chairman Bilawal Bhutto Zardari and Asefa Bhutto Zardari will soon be in the parliament. “The time has come when no dictator can set his sights on the power,” he said. Zardari reminded his audience of the sacrifices he and his party have made for the sake of democracy, claiming that they even declined Musharraf’s power-sharing offer. “It was for democracy that we remained in jail for 15 years,” he said. “It was for democracy that Zulfikar Ali Bhutto kissed the noose. Benazir Bhutto gave her life. When she came here there was an attack on her life but she still took the risk, which was for democracy, not for power. While saying that he is standing at the place where in the past renowned leaders such as Muhammad Ali Jinnah, Liaquat Ali Khan, Zulfiqar Ali Bhutto and Benazir Bhutto once stood, he added that it is time to fight for Kashmir. While referring to Nawaz’s public gathering in Kashmir to mark the solidarity day, Zardari lashed out at the former premier for not mentioning Kashmir during his visit to Muzaffarabad. “Why did Nawaz go to Kashmir when he could not remember mentioning the Kashmir issue over there? We will not leave the Kashmiris alone. We will fight for them. Kashmir is our jugular vein and we have to make our younger generations understand that,” he said while adding that Allah will not forgive Nawaz for forgetting Kashmir in his address. “Many people have ditched the Kashmiris, but I assure you that the PPP will not do so. The PPP will continue its struggle for the Kashmiris,” he concluded. PPP leaders Aitzaz Ahsan, former premiers Yousaf Raza Gillani and Raja Pervez Ashraf, Qamar Zaman Kaira, Shaukat Basra, Samina Khalid Ghurki, Mustafa Nawaz Khokhar, opposition leader in the National Assembly Syed Khurshid Shah, Faisal Saleh Hayat, Pir of Taunsa Sharif Attaullah Taunsvi and others also spoke on the occasion. PPP leader Aitzaz Ahsan said that the Sharif family did not present a single evidence in the Panama case. “Zardari has informed you about the reason for your ouster,” said Ahsan while directing his comment at former prime minister Nawaz. The PPP leader said that Nawaz failed to effectively raise his voice for the plight of the Kashmiris. Leader of the Opposition Khurshid Shah also addressed the rally and said that the Mochi Ground is the place where PPP raised its voice for not just the oppressed Kashmiris, but also for the rights of the underprivileged. At least five party workers suffered minor injuries when a stand for hoisting the party flag fell on them. PPP leaders briefly paused the event and call ambulances, however, the programme was resumed after knowing that no one was seriously injured. The accident occurred after the party workers tried climbing over the stand. The PPP accused the PML-N-led Punjab government of creating hurdles in way of its caravans coming from other cities. 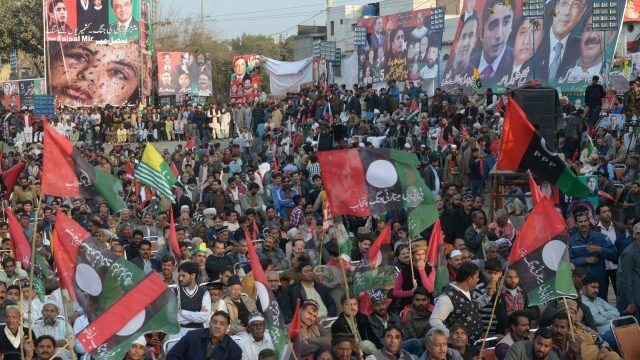 The PPP leaders alleged that the PML-N created hurdles so that the party workers from other cities could not reach the venue of the public gathering. Mians and Zardaris are two sides of same pack! By now the whole nation understands. Why are our Journalists misleading the people?